GRAB YOUR ALE AND GROW YER BEARDS! PROVE YOUR DWARVEN STRENGTH. FIGHT AND DRINK FOR HONOR! 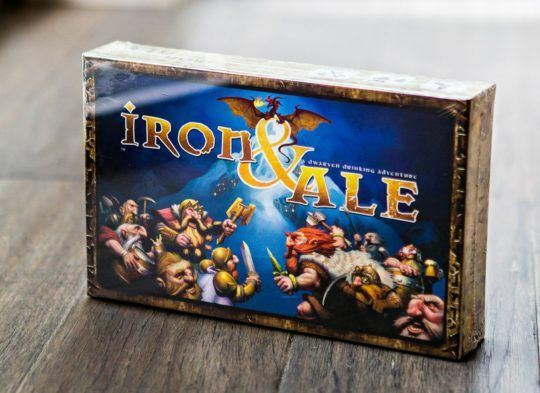 Iron & Ale is 100% Dwarf. It is a game of mining, fighting monsters, drinking and dwarven challenges. You are a Dwarven Lord challenging other players to become the true Dwarven King. To do this you must lead your clan to conquer the mountain and challenge other Dwarven Lords at the Meadhall. The Dwarven Lord with the most honor when the Mountain Deck is depleted wins. The mountain is vast and full of riches guarded by sworn enemies. The mountain is made up of 100 cards filled with monsters, iron ore and gold. Sworn Dwarven enemies, such as Orc tribes, Giants, Trolls, the Legendary Dragon and more lurk in the mountain deck. During the Mountain Phase each player draws one card, exploring and mining the mountain. Every kill, every resource brings honor to your clan.